Written in 1755, Uniformity with God’s Will is a wonderful little treatise on the true love of God. Saint Alphonsus de Liguori writes to encourage believers to unify their wills with that of God’s, so that they may love God perfectly: “the more one unites his will with the divine will, the greater will be his love of God.” To choose otherwise–i.e. to choose not to unify one’s will with God’s–is “a kind of idolatry.” These seven short chapters, not simply prone to abstract speculation, explore concretely how to make one’s own will uniform with God’s through the hardships of this life. 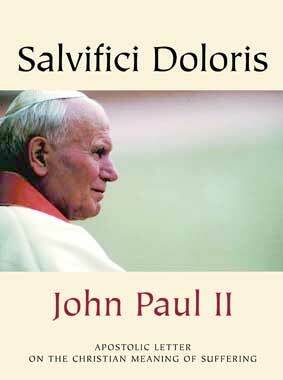 Further, the book discusses the fruit of such a union with God’s will: happiness. De Liguori concludes by noting how, in all things, Christians must remain steadfast in their union with God’s will. For in so doing, God will “press us to his heart.” Challenging and encouraging, Uniformity with God’s Will has the power to remind us of what true love of God really is. For five hundred years, this gentle book, filled with the spirit of the love of God, has brought understanding and comfort to millions of readers in over fifty languages, and provided them with a source of heart-felt personal prayer. These meditations on the life and teachings of Jesus, written in times even more troubled and dangerous than our own, have become second only to the Bible as a guide and inspiration. Since they were first written in 1745, Visits to the Most Blessed Sacrament and the Blessed Virgin Mary has been translated into many languages and read worldwide. This classic translation of St. Alphonsus Liguori’s Visits, a faithful rendition from the original Italian into the American idiom, has now been reprinted in a new larger edition. This new printing offers exactly the same text as the previous edition, but in a larger, more readable, more durable format. It includes St. Alphonsus Liguori’s introductory and concluding prayer, spiritual communion, and his reflection/meditation for each of 31 visits to the Most Blessed Sacrament and the Blessed Virgin Mary. A useful manual for visits to the Blessed Sacrament. Although sitting in silence in the presence of the Blessed Sacrament is the most fruitful, sometimes we need some good prayers to get us started. This rich Catholic prayer book contains a plethora of fruitful devotions, meditations, lessons, hymns, Scripture, prayers of reparation, litanies, and aspirations for visits to the Blessed Sacrament. This manual is patterned on the single Liturgical year so that one can visit the Blessed Sacrament in the spirit of a holy day or the season. Subjects include many saints, the angels, Mary under various titles, Jesus, the Poor Souls, Feasts of the Church, Rogation Days, and a very awesome lengthy Preparation for Death. Ever even heard of the Litany for a Happy Death? The reader can use the prayers and meditations on any given day as the texts seem profitable no matter what the theme. 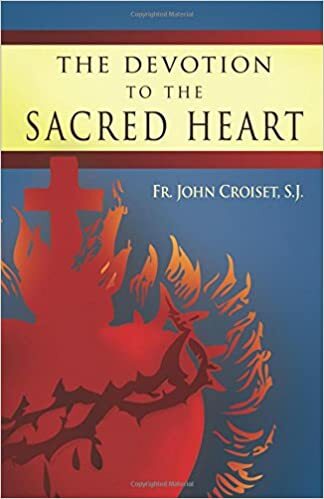 The deep and extraordinary interest taken by so many, in the devotion to the Sacred Heart of our Lord Jesus Christ, the great fruits it has produced, and the singular esteem entertained for it, by persons of universally recognized merit, have led to the publication of this book. It is intended to instruct the faithful, and satisfy their pious desires. There might, perhaps, have been some reason to fear, at the very outset, that the mere title of Devotion to the Sacred Heart of Jesus Christ, however it might attract many persons to read this book, might also deter many others. Arrested by the first words, they might be led to form an inaccurate idea of the devotion. To remove this difficulty, it has been thought well to explain in the beginning, what is understood by devotion to the Sacred Heart of Jesus Christ. Experience has proved, that there is no one, who, after seeing in what it consists, does not agree, that it is reasonable, solid, and most useful, for our salvation, as well as for our perfection. 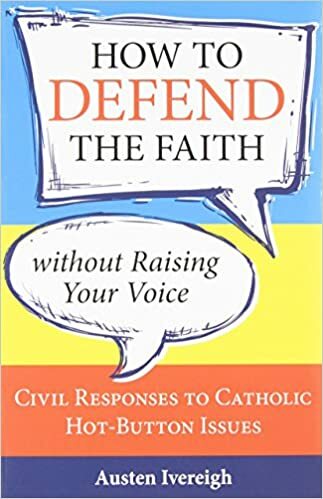 How To Defend The Faith – Austen Ivereigh: : How to Defend theFaith Without Raising Your Voice: Civil Responses to Catholic Hot Button Issues. It is about winning friends, not arguments. It is about shedding light, not heat. It’s about reframing the argument so hearts can be opened and minds can be inspired. 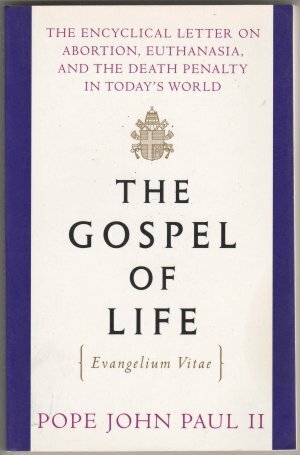 The Gospel of Life, Evangelium Vitae – Karol Wojtyla: From its very title, Evangelium Vitae (The Gospel of Life), Pope John Paul II showed that he wished to give the protection of life, from conception to its natural end, a highly positive character and great new spiritual thrust. While realistically countering new and unprecedented threats to life and the rapid spread of a “culture of death”, the primary intention of this document is to proclaim the good news of the value and dignity of each human life, of its grandeur and worth, also in its temporal phase. The cause of life is in fact at the same time the cause of the Gospel and the cause of man, the cause entrusted to the church.This encyclical was published following consultation with an extraordinary Consistory of Cardinals in 1991 and subsequently with all the bishops of the world. It is “a precise and vigorous reaffirmation of the value of human life and its inviolability,” containing “a pressing appeal addressed to each and every person in the name of God: Respect, protect, love and serve life, every human life! Only in this direction will you find justice, development, true freedom, peace and happiness”. Answering the Atheists – Bishop Barron: It is important that we Christians are able to answer the atheist’s best objections to God’s existence in hopes that we can win their hearts and the heart of the culture at large. That’s why Bishop Barron recently devoted a whole episode of his podcast, “The Word on Fire Show,” to answering the atheists. Fire Show,” to exploring these questions. In this ebook you’ll find an edited transcript of the show so you can read it slowly, at your own pace, and refect on how God is leading you in your life. In the end, all discernment boils down to one ultimate goal: fnding the path of greatest love. Let’s seek that path together.